Oh, my goodness, I LOVE, LOVE, LOVE, Butternut Squash Breakfast Muffins! These little breakfast bites are soooo delectable. Yes, I started with my delicious Breakfast Muffins recipe. I added a few more spices, and swapped out the bacon for finely diced butternut squash. 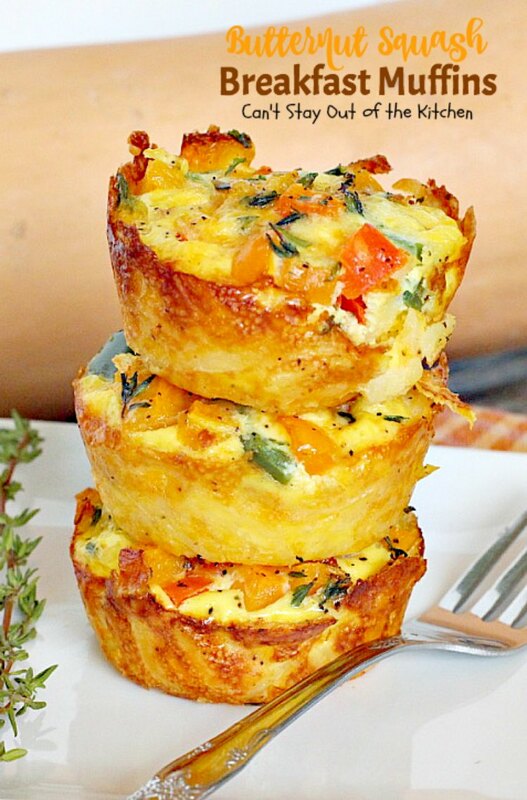 Awesome does not even begin to describe how wonderful this recipe tastes. The last weekend of January, I volunteered to make four meals for the freshman high school girls in our church who were participating in a Disciple Now Weekend. I made two dinners and one breakfast, and some friends we know volunteered to make the other breakfast meal. 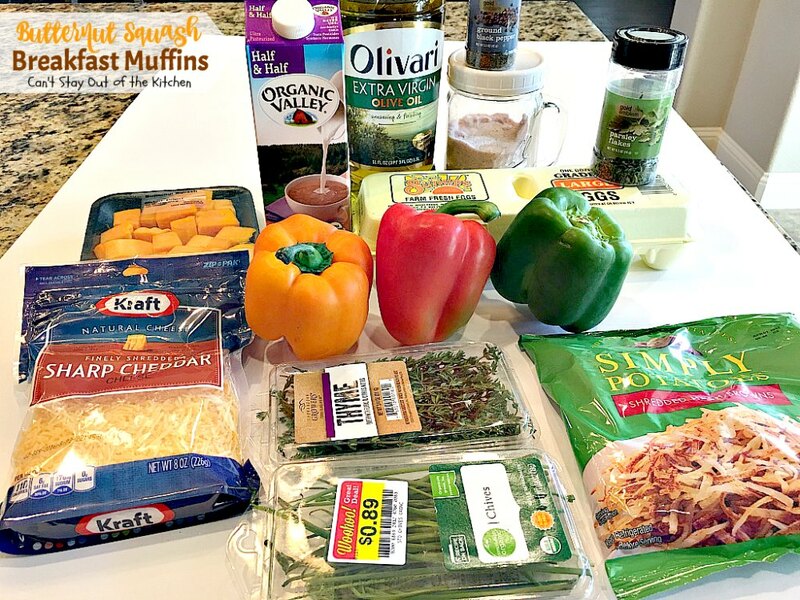 I whipped up a batch of these muffins along with a coffeecake and some fruit for breakfast. I heard that these were very well received. (I loved the two I sampled!) 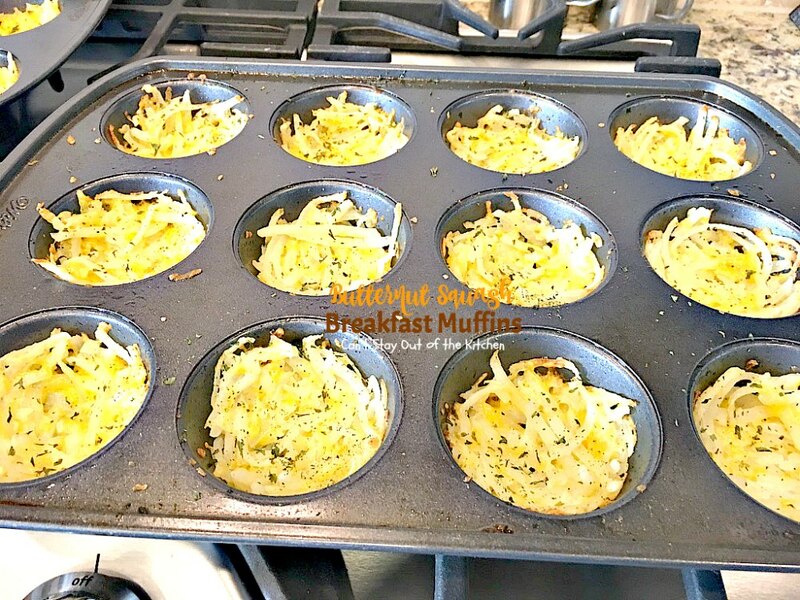 🙂 Each batch makes 24 muffins, so a single batch can serve 12 people quite well. 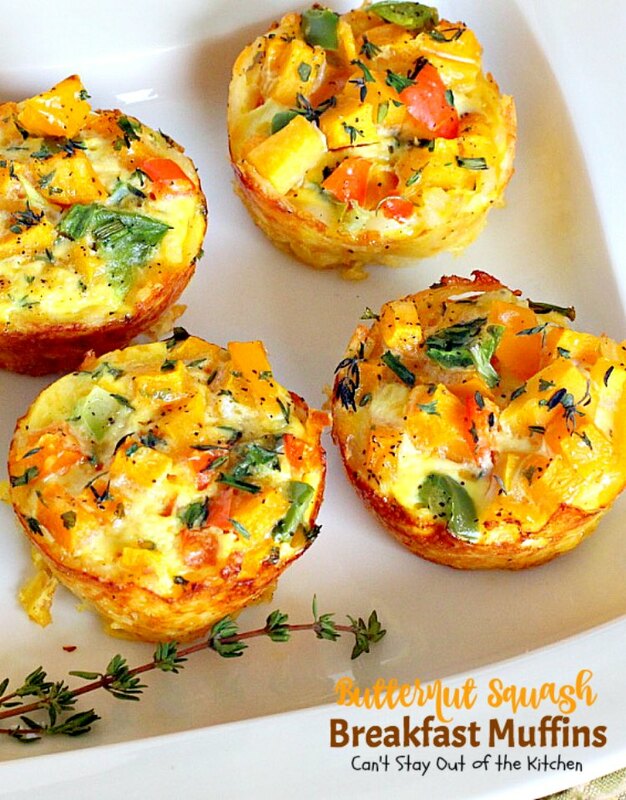 Butternut Squash Breakfast Muffins are also great muffins to eat on the fly! They are easily frozen or refrigerated (if you’re going to be eating them up within a week). Then just microwave before you’re ready to dash out the door. 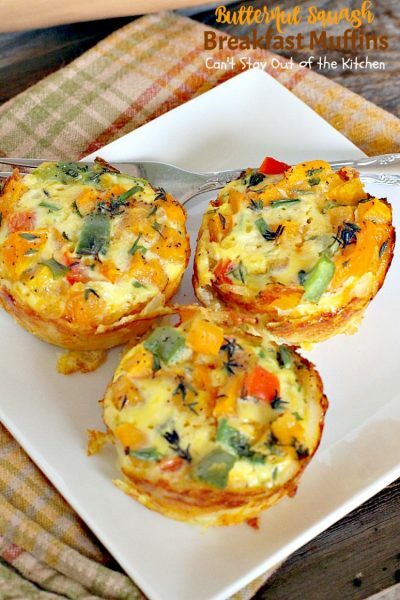 They’re a perfect breakfast with plenty of protein to keep you going for hours. Plus, this is a clean-eating recipe using veggies instead of any processed meats, so it’s a little healthier, too. I’ve made Breakfast Muffins with bacon, with ham, Spinach and Artichokes, Tomatoes and Mushrooms, and now these with butternut squash. I love them all! 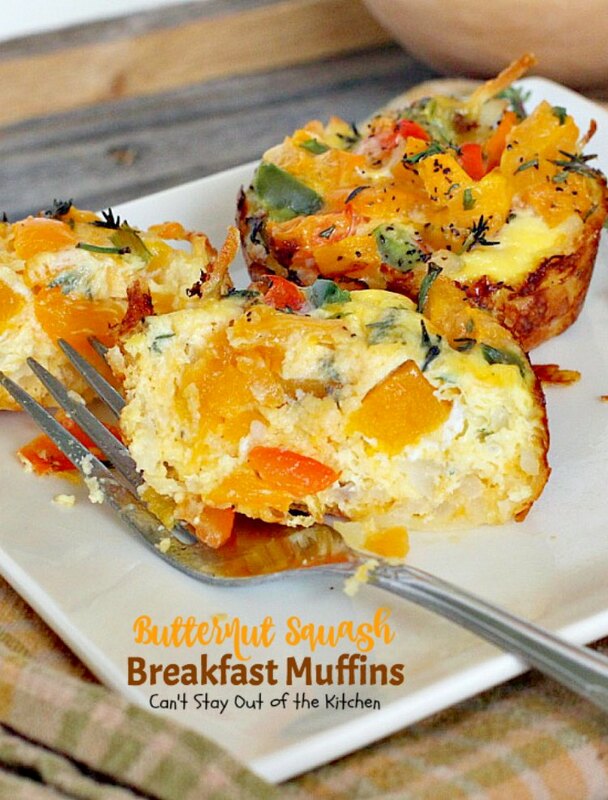 But these Butternut Squash Breakfast Muffins are divine. I think you’ll think so too after you try one. Butternut Squash Breakfast Muffins are divine! 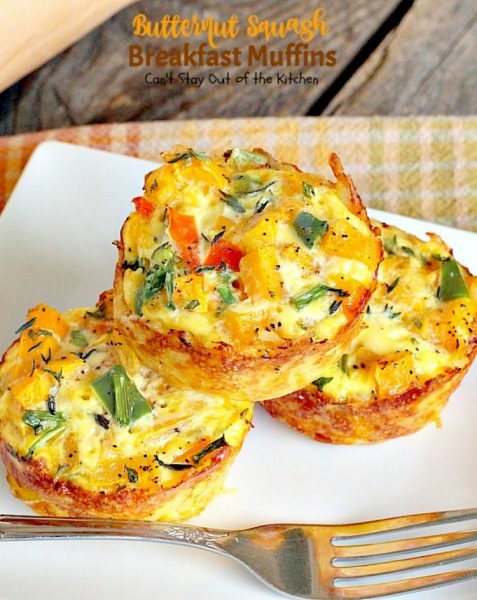 I loved the taste of these muffins. Be sure you finely dice the butternut squash so it cooks through in the allotted time. (I chopped mine up pretty small so I wouldn’t have that problem). I sprinkled fresh thyme, chives and parsley on top and it added such delicious flavor to the Butternut Squash Breakfast Muffins. 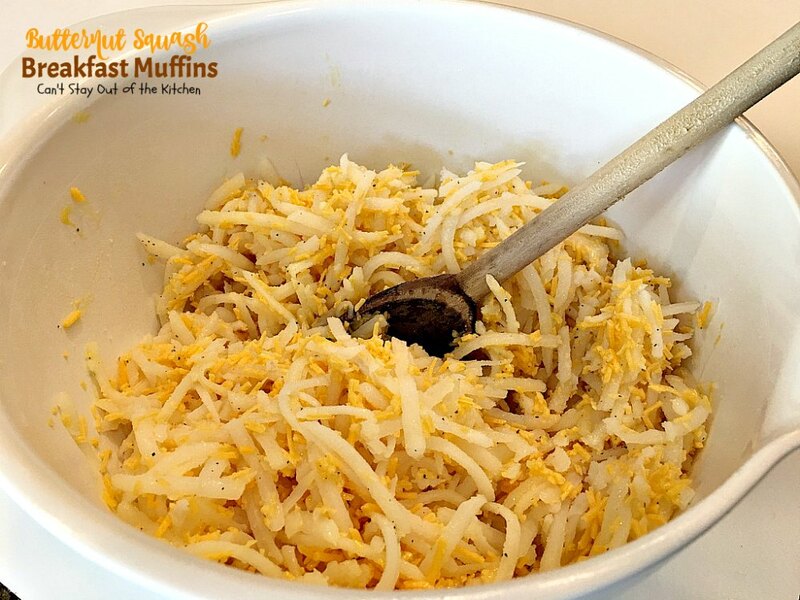 Place fresh hash brown potatoes in a large mixing bowl. 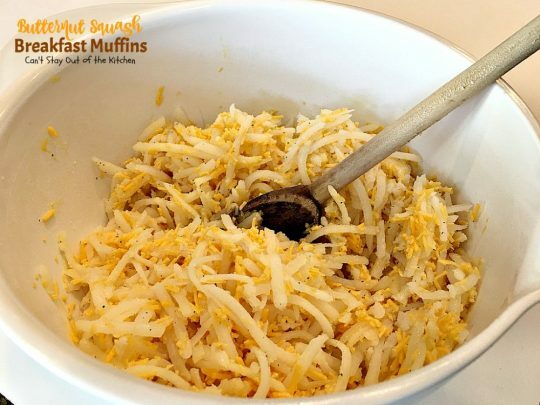 (Or you can use frozen, thawed hash browns). Add egg, part of the salt and pepper, part of the cheese and olive oil. 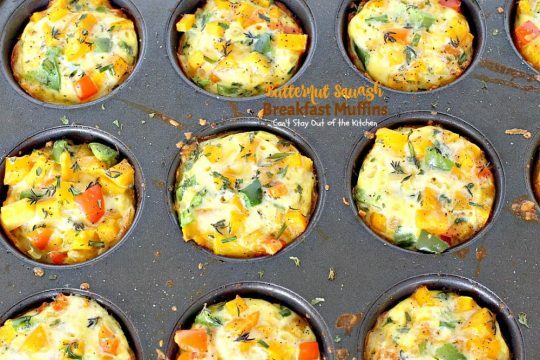 Spray 24 muffin tins very well with cooking spray. Divide potato mixture between the 24 tins and press potatoes down and into the sides firmly. 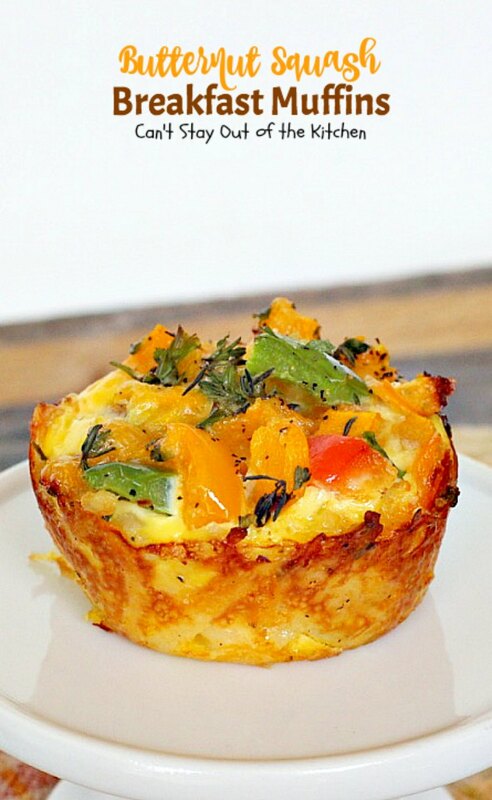 Sprinkle each muffin with parsley flakes. Bake at 400 degrees about 10-15 minutes, until potatoes just start getting a little crispy. Meanwhile, prepare custard portion of muffin. Beat eggs in a mixing bowl. Add red, orange and green bell pepper, finely diced butternut squash, remaining cheese, remaining salt and pepper, seasonings and half-and-half. 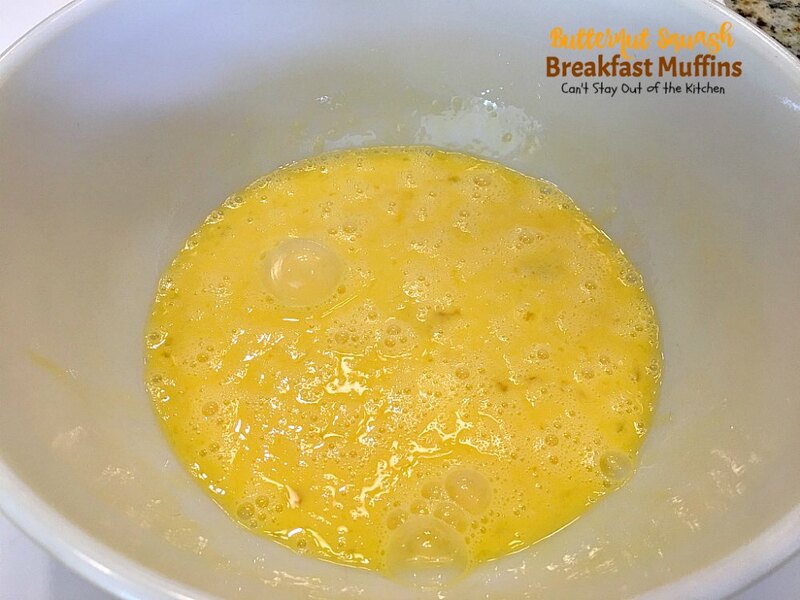 Divide custard mixture between the 24 muffin tins. Sprinkle each tin with additional salt, pepper, parsley, thyme and snipped chives. Bake an additional 10-15 minutes at 400 degrees until egg custard is cooked through. (Mine actually took about 21 minutes to cook through enough). Cool about 5 minutes before gently removing from pans. I use a very small, narrow rubber spatula. 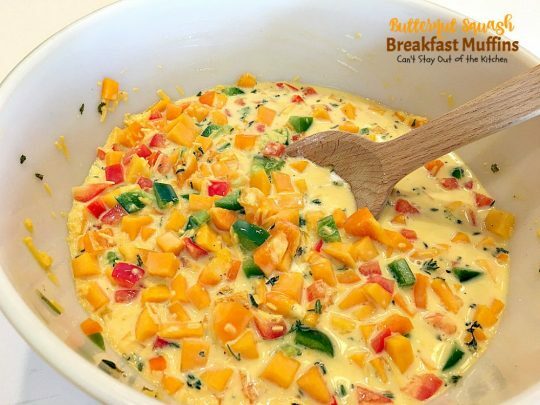 Carefully ease it around the sides and gently lift the bottom each time you move the spatula around the sides of the pan. Butternut Squash Breakfast Muffins makes a perfect holiday breakfast. I served it with Sour Cream Coffee Cake and fruit. These vegetarian muffins are simply wonderful. If you’re trying to stay away from meat, here’s a way to get plenty of protein without sacrificing flavor or texture. 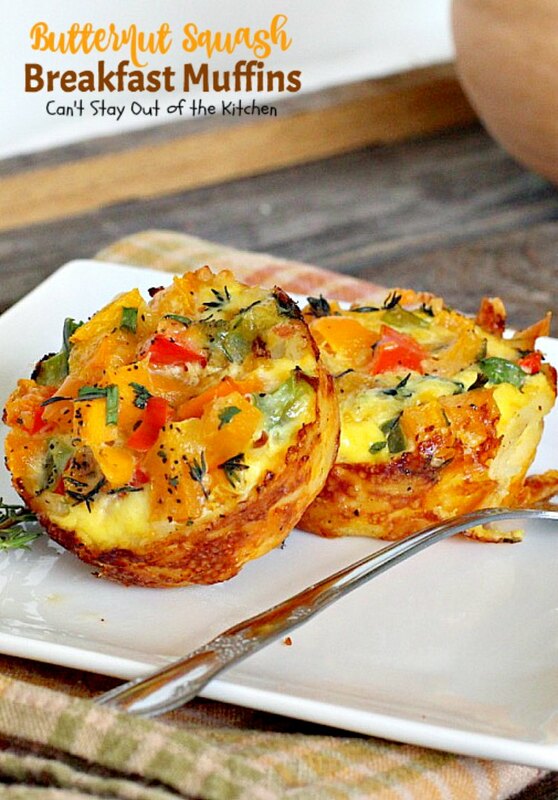 These healthy breakfast muffins are terrific grab and go muffins, too. They heat up in the microwave very quickly and easily. These delectable muffins are terrific for holiday breakfasts, especially if you prefer a vegetarian option without meat. Gluten free. Add remaining 1 cup cheese, remaining salt and pepper, butternut squash, red, yellow and orange bell peppers, 1 tsp. fresh thyme, 1 tsp. fresh parsley and half-and-half. 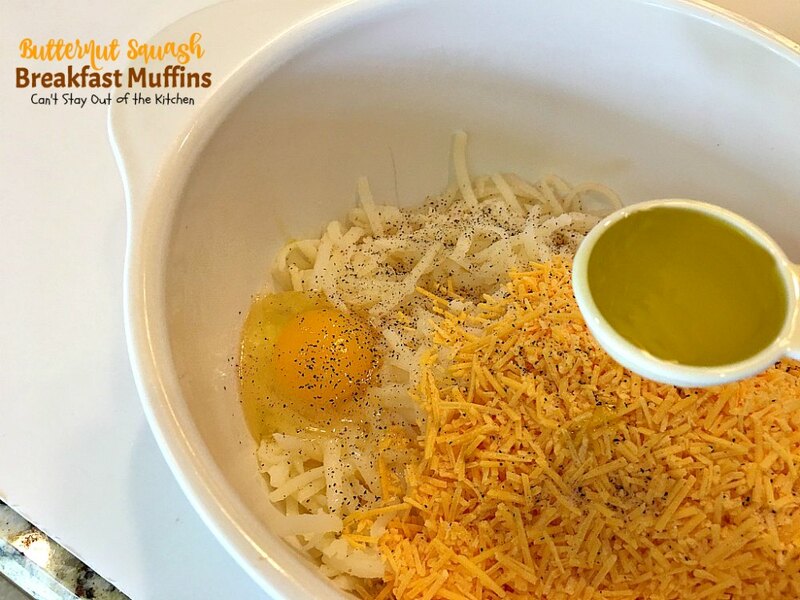 Pour egg mixture evenly over each potato muffin crust. Sprinkle with additional salt, pepper, thyme, parsley and freshly snipped chives, if desired. 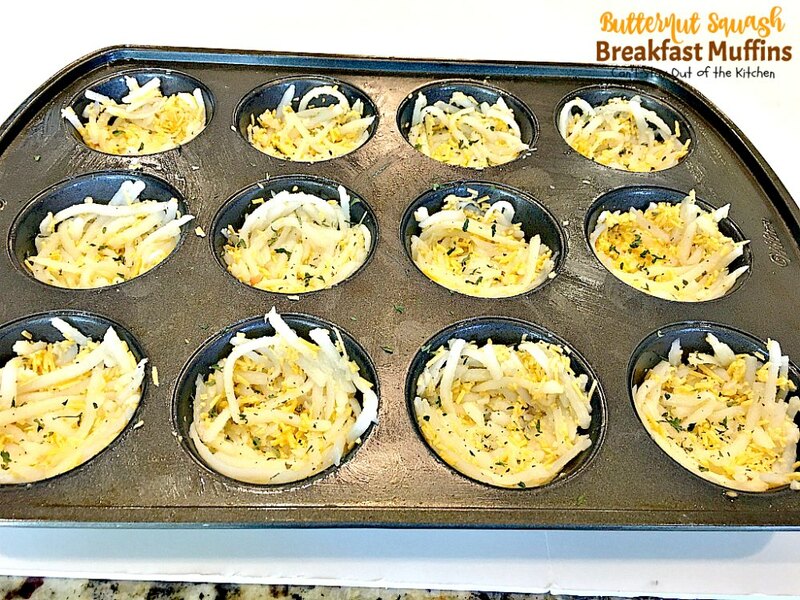 Allow muffins to cool in muffin tins about 5 minutes before gently removing from tins. NOTE: These can also be frozen and reheated for individual use. Microwave until done. NOTE: The butternut squash needs to be diced very fine in order to cook thoroughly in the allotted time. NOTE: I used a 10-oz. pkg. pre-cubed butternut squash that I cut down into fine dice. It ended up being just over 2 cups. NOTE: My oven took an additional 21 minutes until the eggs were cooked (not 10-15). NOTE: I do not recommend using coconut oil to grease the muffin tins. 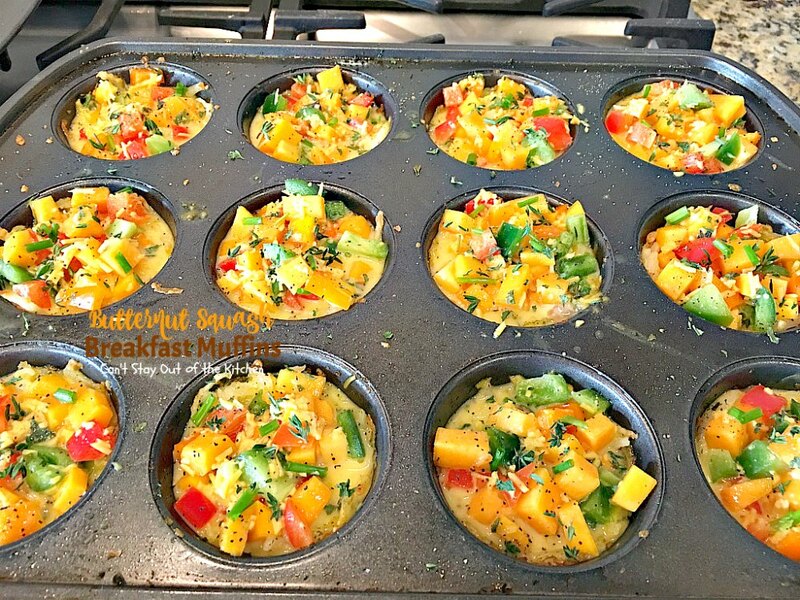 If you’re cooking for a crowd, baby shower or office party, these Butternut Squash Breakfast Muffins are great to put on the menu. 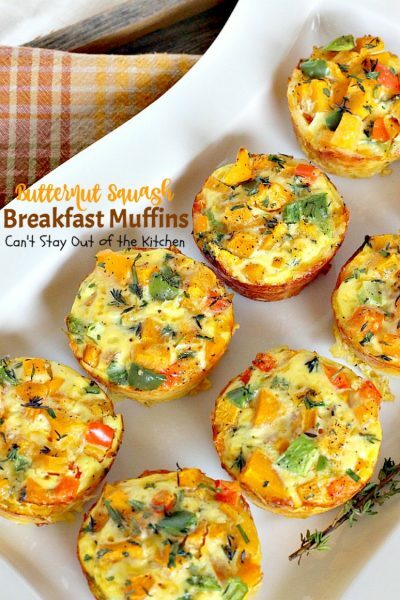 Every bite of Butternut Squash Breakfast Muffins is delectable. You’ll be drooling after the first bite. 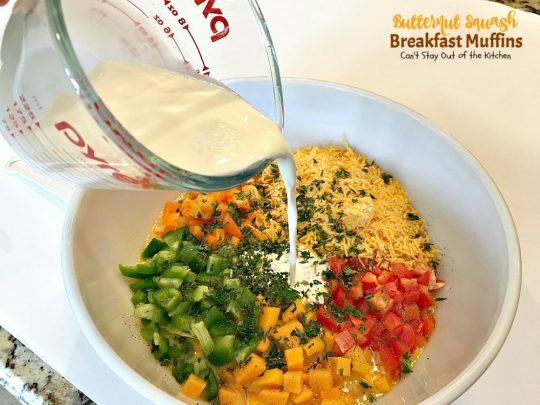 While these are traditionally served for breakfast, you can also serve them for Meatless Mondays or Breakfast for Dinner! Oh, I think that would work wonderfully! Thanks for sharing the idea. Hope everyone enjoys them. What a wonderful idea – these look and sound amazing!